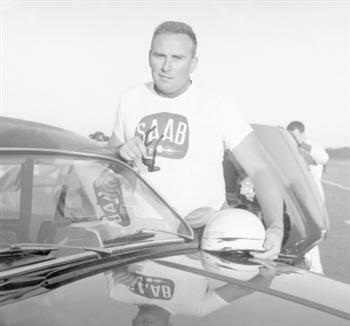 Erik ‘Mr Saab’ Carlsson was 80 years young earlier this month (5th March) and still employed by Saab, making him the Swedish manufacturer’s longest-serving employee. As one of international rallying’s first real well-known names, Erik’s career with Saab spans six decades and today he remains actively involved as an international ambassador for the brand, attending Saab launches, dealer and customer events around the world. The names of Carlsson and Saab are inextricably bound together. Born and bred in Saab’s home town of Trollhättan, Sweden, Erik first sprang to fame in the early Sixties, as ‘the big man in a little car’, taking two back-to-back victories in the Monte Carlo Rally (1962-63) and a hat-trick of wins in the British RAC Rally (1960-62). His ‘David and Goliath’ exploits against more powerful cars were the springboard for launching Saab as a global car brand. As a young boy, Erik used to stand on the perimeter of the local airfield in Trollhättan and admire the aerobatics of Saab aircraft flying overhead. Little did he know that Saab would soon start manufacturing cars, and that he would play such a key role in promoting its products. 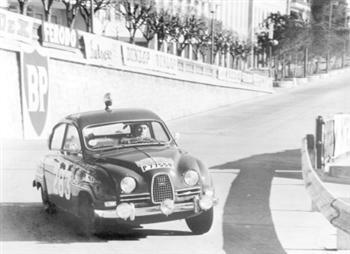 He bought his first car, a second-hand Saab 92, in 1955 and it was a development of this car, the Saab 96, which took him to his most famous rally victories. Over the years, he has driven thousands of Saab cars and been involved in the development and testing of many of the models. There is probably no man on the planet who has driven more Saabs than Erik. He currently drives a Saab 9-3 Aero SportCombi and, in celebration of his 80th birthday, Saab Switzerland launched an uprated ‘Erik Carlsson’ edition of the 9-3 SportCombi and Sport Sedan, both featuring Saab’s widely-acclaimed XWD, all-wheel-drive system. An ebullient character, full of stories and anecdotes laced with a Swedish charm for understatement, Erik continues to ‘live his dream’. 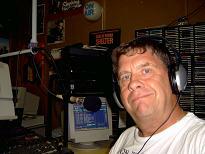 He is still in great demand as a celebrity guest and entertaining speaker. His extraordinary memory for faces and names is as sharp as ever and almost as legendary as his exploits behind the wheel. Very much a ‘people person’, Erik is never happier than when meeting and sharing his experiences with enthusiasts. Erik enjoyed his birthday at home with close family and friends. On Saturday, 14th March, he attended a special Open Day at the Saab Car Museum in Trollhättan held in his honour.